Today we’ll detail another objective towards VCP-DCV 2019 Certification – Objective 1.10 – Describe a virtual machine (VM) file structure. Again, read the docs as well as we won’t be able to cover everything – make sure to read the PDFs. The VMware Exam blueprint has 41 chapters (Objectives). VCP-DCV 2019 certification is the latest certification based on vSphere 6.7. VMware changed the rules of re-certification recently. Our Post: VMware Certification Changes in 2019 has the details. No mandatory recertification after 2 years. Older certification holders (up to VCP5) can pass the new exam without a mandatory course, only recommended courses are listed). So let’s get started. For this lesson, we’re using “Virtual Machine Administration” PDF. 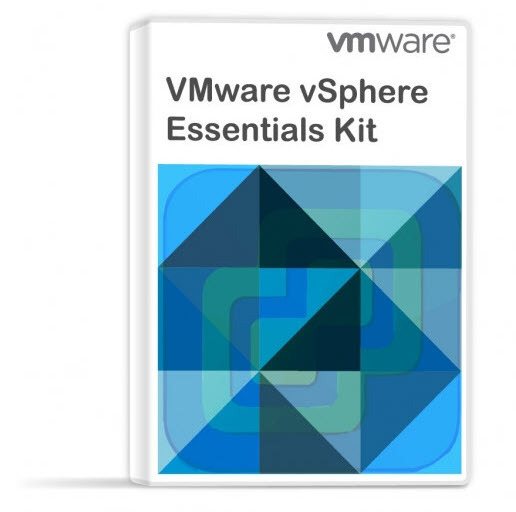 Check the VCP6.7-DCV Study Guide Page for the whole documentation set. 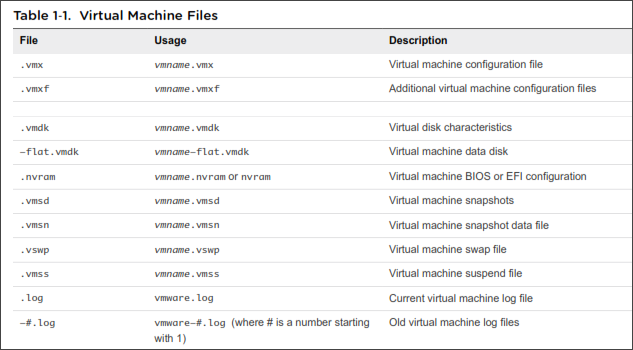 Here are the principal files that each VM has. You have then some additional files created after VM runs for a while. A file called .hlog file is a log file that is used by vCenter Server to keep track of virtual machine files that must be removed after a certain operation completes. Another file called .vmtx file is created when you convert a virtual machine to a template. The .vmtx file replaces the virtual machine configuration file (.vmx file). What is VMware CTK, and what’s inside the file? CTK file is also inside the VM folder. The CTK file is used by Changed Block Tracking (CBT). It lists the block changes made since the last backup. The first backup of a VM has to be a full backup, only then onwards the CBT reads the content of the CTK file, and back up changed blocks only instead of full VM backup. Every block has got a time stamp which says where the location of the modified block is. The size of this file is fixed and does not grow over its initial size. Only if you grow the size of a virtual disk than the size of CTK file changes. The real size of this CTK file depends on the size of a virtual disk, but it’s about .5MB for every 10 GB of virtual disk size. The CTK’s file content stores the state of each block, for tracking purposes, and is using sequence numbers. Those sequence numbers are used by a backup application, to see if a block has changed its state or not. A file with extension CTK can be found by using the VMware datastore browser, in the same folder as other VMDK file, where the VM stores all its files (VMDK, VMX, VMSD, NVRAM….). If you don’t see the CTK file, then certainly the CBT just isn’t activated. The CBT functionality is available for VMs with the virtual hardware version isn’t 7 and higher. The CBT is usually activated by backup products, like Veeam or VDP automatically during the first backup. The CBT can also be activated manually, through the vSphere web client and Advanced settings of the VM, OR, editing directly the configuration file of a particular VM (VMX file). When a virtual machine snapshot is created, all attached disks are snapshotted simultaneously. So there will be one delta disk per virtual machine disk, per snapshot. Check vSphere “Virtual Machine Administration” PDF page 13. Virtual machine options will allow you to fine-tune the settings and behavior of your virtual machine and to ensure maximum performance. General Options – modify the name, check the config file and working location. Encryption Options – you can enable encryption for the VM (needs a Key management server not available from VMware, but through a partner). Power management – Suspend the virtual machine or leave the virtual machine powered on when you put the guest operating system into standby. 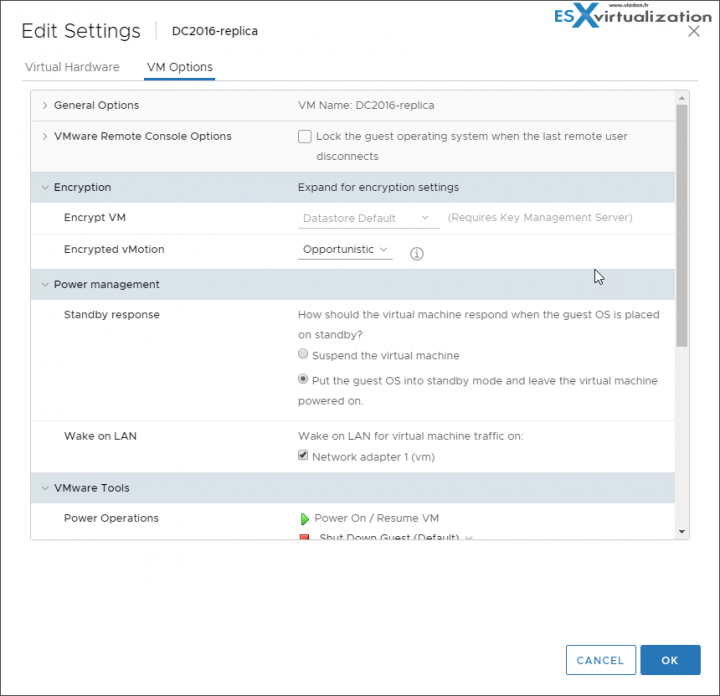 VMware Tools – power controls for the virtual machine and run VMware Tools scripts. You can also upgrade VMware Tools during power cycling and synchronize guest time with the host. Boot Options – you can set the boot delay when powering ON. Advanced Options – Disable acceleration and enable logging, configure debugging and statistics, and change the swap file location. You can also change the latency sensitivity and add configuration parameters. Also, you can enable or disable Change block tracking (CTK). Fibre channel NPIV – control VMs access to LUNs on per-VM basis. vApp Options – enable or disable vApp Options. You can view and edit vApp properties, vApp Deployment options, and vApp Authoring options. Check the VCP6.7-DCV Study Guide Page for all objectives towards VCP-DCV 2019 certification. You’ll also find a links to the whole documentation set. This was a short lesson compared to others, but there is 41 lessons to cover the whole blueprint.